First of all I wanna thank Tiffo for giving me this super unique award! Tiffo is one of my new blogends. She's from Taiwan (if I'm not mistaken) and also love makeup and a lot of foods like me! Haha. Let's toast to that tiff! I really like her posts coz it's really detailed especially when it comes to reviews. She's super sweet so you really need to follow and be friends with her! I'm currently addicted to nail art designing this past few weeks. coz I'm trying to save for something else. Haha. I even made youtube tutorials for it. LOL. Got super tanned (burnt. LOL) from the beach and I'm totally hating it. 4 hours long drive from Manila to Zambales. But I really enjoyed our stay at the Zambales beach. Love the big waves and everything. I just hope I didn't get super tanned coz it lessens my confidence a bit. Now, I don't wanna take pictures of me anymore. 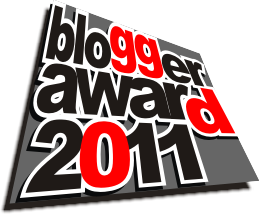 I wanna give this award to my 9 new bloggends! Thank you so much to my old and new followers! Thank you for supporting and inspiring me with your sweet comments. those glasses look great on u!!! that's great u like the Zambales beach. which one did u go to? your blog is so cute! n congrats to 800 followers wow!! Congrats! And thank you so much! Haha, I know what you mean. I swear my nail polish collection is growing way too fast! Hi i am new guy for this blog. About your blog i learn some new ideas. Its really simple and perfect matches to your blog. white background is attraction for this blog. Every one like this kind of template only. No problem Kat. (; It was all you, I really enjoy your blog! Hahaha for sure, a toast to being little piggies! It's truly very difficult in this full of activity life to listen news on TV, thus I just use world wide web for that purpose, and obtain the most recent information. Nice post. I was checking continuously this blog and I'm impressed! Very useful info specifically the remaining section :) I care for such info much. I was seeking this particular info for a long time. Thank you and good luck. Having reɑd this I believed it ԝɑѕ extremely еnlightening.